When it comes to travel in Iraqi Kurdistan (the semi-autonomous region of Northern Iraq), it can be quite difficult to gauge how much money a traveler would need for such a visit. There really isn’t much information to be found on the internet and as a result, even before I traveled there, I had no idea if this region would prove to be cheap, expensive or somewhere in between in comparison to other parts of the world, including the nearby countries of Syria and Lebanon. So now that my visit has ended, I am happy to report that Iraqi Kurdistan is definitely accessible for travelers of all kinds, including those who need to stick to a tight budget. It is possible to travel this region for about $35 USD per day, as long as you stick with budget hotels and simple shawarma sandwiches for meals. And if you’re able to find the handful of hotels that offer dorm rooms, you could probably cut your costs down to $20 USD if needed. If you choose to spend your nights in 3-star, mid-range hotels, and eat in hotel restaurants, you should expect to spend about $80+ USD per day, although you’ll probably agree that the difference in price may not be worth it once you read the below section on “Accommodation”. 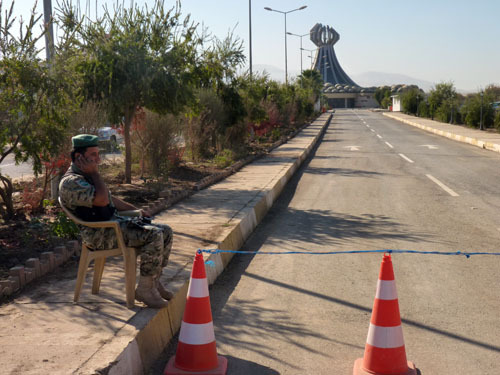 For a handful of citizens – USA, Canada, UK, the European Union and Australia – obtaining a visa is as simple as showing up at the land border between Iraqi Kurdistan and Turkey or flying into the regional capital of Erbil. 10-day tourist visas are provided free of charge for citizens of these countries. Other nationalities must obtain an Iraqi Kurdistan permit/visa from an Iraqi Embassy or Consulate before traveling to Kurdistan or else they will be denied entry at the border. The 10-day visas do state that all travelers must visit the Directorate of Residence at some point within those ten days, at which time you can also apply for a visa extension, but there is some confusion as to whether or not this is really necessary. Read this post about my experience at the Directorate for more information regarding the crazy bureaucracy involved with visiting this government department. Budget accommodation in Iraqi Kurdistan is surprisingly comfortable and easy to find. A quick walk through the center of any town or city will pass by several, if not dozens, of hotel options, ranging from cheap and dingy to three-star quality. For the budget traveler, the cheaper options should be more than suitable as even these hotels all generally have lobbies, reception desks and relatively clean and spacious rooms, all with private bathrooms and sometimes, a refrigerator and television. Dorm Room: A few ultra-budget hotels in each city offer dorm beds for around 12,000 – 18,000 ID per night. Single Room: Actual single rooms don’t really exist and so most hotels will charge approximately 75% of the double room rate for single occupancy. Prices range between 24,000 – 40,000 ID. Double Room: Good rooms for two people are easy to find and are of great value, typically costing between 35,000 – 50,000 ID per night, which, when split between two people, is quite a bargain for what you receive. Erbil: Hotel Shahan, located on the main road right below the Erbil Citadel, offers basic but clean and comfortable rooms at good rates. Single rooms cost 40,000 ID and double rooms 50,000 ID per night. Sulamainiyah: Take a taxi to the Ashti Hotel on Salim Street and you’ll find several other hotel options for all budgets within a two-minute walk. Right around the corner from the Ashti is the Chrkan Hotel, where good double rooms are available for around 50,000 ID per night. Dohuk: The centrally located and friendly Bircin Hotel was the best value hotel I found in all of Kurdistan. For only 20,000 ID, this hotel offers spacious and clean double rooms with large private bathrooms and wi-fi access (for a small fee). 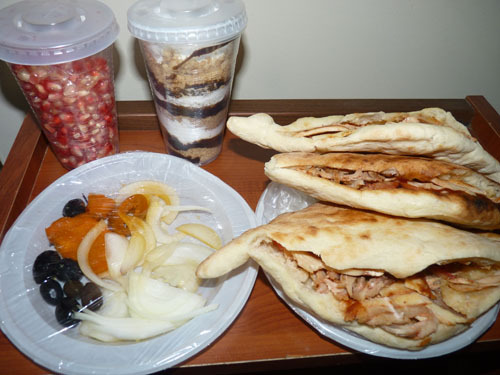 In addition, most budget hotels also include a decent Middle Eastern breakfast (eggs, bread and vegetables) in the price of the room, however, the reception staff never seem to inform you of this fact when you are checking in. Just show up in the lobby before 10am and join the other guests who are eating their complimentary meal. Unfortunately, food proved to be the greatest challenge of my visit to Iraqi Kurdistan as there simply is not much variety at all. Eating out almost always involves visiting a shawarma shop for a quick chicken or beef sandwich in pita bread. If you’re lucky, you may find a shop selling falafel sandwiches but the falafel are usually 99% bread crumbs and 1% actual chickpeas. If you’re super lucky, you just may stumble upon an eatery selling salads and roasted chicken (I saw one of these places during my stay). “A Taste of Eating Out in Iraq“. Occasionally, you may find a more upscale restaurant if you venture beyond the city centers. For example, in the Ainkawa district of Erbil (the Christian quarter), I noticed a few restaurants that seemed to serve a wider variety of Middle Eastern cuisine. In addition, the best meal I ate on the trip happened to be at Deutscher Hof, a German restaurant and pub in Erbil that served up excellent German fare in a relaxing setting for very reasonable prices ($25 USD per person for an entree, meal and drink). For vegetarians, Iraqi Kurdistan will prove even more challenging as you’ll undoubtedly get sick of falafel sandwiches by the end of your first day. It will take some extra effort but chances are that you can eventually locate a restaurant that serves a variety of salads, such as Pizza Plus in Sulamainiyah. Apart from that, you can pick up some fruit at the local markets and there are always vendors around selling fresh bread! Unlike many destinations that are full of specific sights to see, most places in Kurdistan are best enjoyed by simply hitting the streets, going for a wander and seeing where you end up. As a result, unless you are interested in visiting an outer suburb (such as Ainkawa in Erbil), your own two feet are you best option for moving around. But when you do need to take a taxi, they are plentiful and cheap when traveling within a particular city or town. Local Taxis: Official taxis are either cream color or part white/part orange and it will rarely take you more than 20 seconds to find one. Prices are generally fixed, but of course, you may end up with a driver who will try to charge you a little more, so it’s a good idea to find out ahead of time (from your hotel, etc.) what the official price should be. As an example of cost, in Erbil, most journeys within the city center cost 2000 ID and a trip out to one of the suburbs costs 3000 ID. Long-Distance Taxis: Traveling between cities is also quite simple as every city has one or more ‘garaj’ where official, long-distance shared-taxis gather. You simply show up at the ‘garaj’, tell the first person who asks where you’re headed and you’ll be led to the proper line of taxis. Once the next taxi is full (with 4 people), you’ll pay the official price to the ticket man and off you’ll go. It can be a little confusing trying to figure out which ‘garaj’ you need to go to as some of the destinations can sound quite similar. But, for example, if you’re in the city of Dohuk and you want to travel to Erbil, you would tell the taxi driver to take you to “Erbil Garaj”. If you were headed to Zakho, you’d want to go to the “Zakho Garaj” instead. You will see actual buses every now and then traveling between destinations, however, it is not a recommended mode of travel for foreigners. These buses, instead of traveling directly to their destination, often stop in either Kirkuk or Mosul, two cities located just outside of the safety of Kurdistan and each of which is considered one of the most dangerous cities on the planet. While Kurdistan is a safe place to visit, these two cities present a very real threat to foreigners and should be avoided. 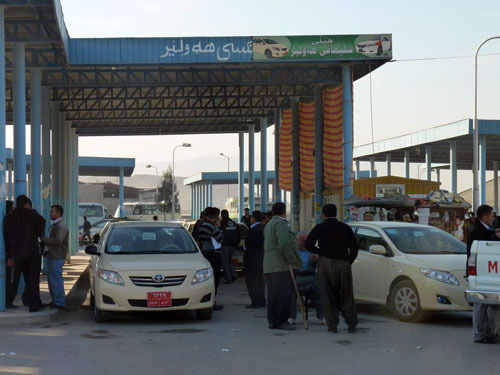 The shared-taxis do not stop in Mosul or Kirkuk, although they do leave the safety of Kurdistan and travel through the outskirts of these cities without stopping. If you wish to avoid these areas altogether, you would need to hire a private taxi to take you to your destination, using a much longer route through the mountains that will cost approximately $70 USD for a ride between Erbil and Sulamainyah. To/From Kurdistan: If you’re traveling overland into Iraqi Kurdistan, you can find a detailed guide and outline of the costs involved by reading this post I recently wrote about my experience traveling to Kurdistan from Syria. There really aren’t too many actual tourist sights in Iraqi Kurdistan, so entrance fees will not be a major expense at all. Places such as the Erbil Citadel and Minaret Park are free of charge and other interesting places to visit simply involve walking around a town, which of course doesn’t cost anything. The only entrance fee I had to pay was 2000 ID when visiting the memorial at Halabja, the village where Saddam gassed and killed over 3000 people in the final days of the Iran-Iraq war in 1988. And even if the entrance fee was significantly higher, this site would still be well worth a visit. Apart from that one site, however, every other place of interest that I visited was free of charge. Iraqi Kurdistan is by no means the most connected region of the world, but there are enough internet cafes and wi-fi signals around so that anyone relying on the internet for work, could survive without too much of a struggle. In the capital city of Erbil, I found two internet cafes in the city center, both of which offered quite reliable connections for around 1200 ID per hour. One of these internet cafes is located just below the Citadel under the four-star Erbil Tower Hotel. In Sulaymaniyah, I managed to find at least a dozen wi-fi signals from my hotel room, although it was a struggle to connect for more than a couple of minutes at a time. However, it turns out that shisha cafes, such as the Shawany Maliek Cafeteria just off of Salim Street near the Great Shang-Hai Chinese Restaurant, offers free wi-fi for customers. Order some apple shisha (about 9000 ID per hookah) and you can sit in a big comfortable chair using the internet for as long as you want. In Dohuk, the budget hotel I stayed at (Hotel Bircin) actually had wi-fi available at a cost of 1200 ID per hour and for those who don’t travel with a laptop, there was also a huge internet cafe just across the street. And interestingly, unlike neighboring Syria or nearby Lebanon, there did not appear to be any government censorship of the internet in Kurdistan. Websites such as Facebook and Twitter, which are not officially accessible in other Middle Eastern countries, are easily accessible in this region. Apparently, for the independent traveler, it’s possible to find work teaching English in the major towns and cities of Kurdistan. I’m not too sure about the potential wages and I have not met anyone myself who is teaching English here, but I have heard through other people that it is possible. Considering that you only receive a 10-day visa upon arrival, it’s probably best to do some research beforehand and try to find a language school that needs foreigner teachers. Otherwise, you could always visit the more expensive hotels or even the internet cafes, both of which tend to have more English speaking staff, and start your search from there by simply asking around. Very few people in Kurdistan speak English, so it pays to learn some Arabic or Kurdish ahead of time or at least carry around a phrasebook. Bargaining is not at all common and you will almost always be charged the local prices given that locals are not yet used to foreign travelers. Bottled water is available everywhere although you will rarely find large bottles. Some hotels have filtered drinking water machines where you can fill up your bottles safely instead of having to buy more bottles. There are no ATMS in Iraqi Kurdistan at all and no credit card services either. You must bring plenty of cash with you – US Dollars, Euros and Turkish Lira would be best – which can be exchanged for Iraqi Dinars with the money-changers that line most of the main streets in every town. Any questions about the cost of traveling in Iraqi Kurdistan that I didn’t address above? Please leave a comment below or send me an email and I’d be more than happy to help out as much as I can! Hello Jack, I am Michel, 45, from The Netherlands (my writing in English may be a bit “Dutch”…). In April 2012 I visited Erbil, and it was a very nice experience! Of course, things can change very quickly, especially in Kurdistan, so my information may not be “up to date” anymore, two years later, but I can definetely recommend you to visit to visit the parks in Erbil, stroll through the streets around the Citadel, and if you can, be sure to visit the mountain region north of Erbil (Shaqlawa, the waterfalls). In April 2012 I felt absolutely safe in Erbil, virtually all the people I met were very friendly to me, and it really helped that I had learned some Sorani phrases, to “break the ice”, Kurds appreciate that! Have a good time in Kurdistan! Thanks for putting this information all together, its a great resource and I am hugely jealous of what you are doing! Heading to Kurdistan next month for 7 days and was wondering if you could tell me the key things I should go and see in the region: castles, monestaries, sites etc. Also if you would be able to tell me how long they take to get to, costs of transport and entrance that would be awesome. I’m currently trying to put together a list of things that I shold do whilst there and work out the best way to do it! Hey Jack – Everything you need to know can be found over on a site I created about Kurdistan – GoKurdistan.com. Check it out for all kinds of information! Iam from Kurdistan and i have to say thanks for these helpful information to who want visit Kurdistan. And about Wi-Fi now every single coffee have a Wi-Fi if one caffee have not it no one will visit it. That’s great to know Alfredo! Thank you for sharing. Hey Rezan – I actually was in Sulaymaniyah as well and loved my time there. I’ll be back in May! Great information! I will be travelling here in march with my 3 children (2 5 & 8) as they have family from their. Food i thought would have been pretty good as my partner makes a lot of different food as to what he had learnt from his mum. I think that Kurdistan is a fast changing ‘place’ and for the better. Cant wait to go and visit, only problem for me is going to be the language…. Hi, have been reading your blog with interest as I travel to kurdistan from uk frequently and have done for the past 5 years. I find it amusing to see it through someone elses eyes but think you missed lots of opportunity to try real kurdish food. Shawarma is just a snack! staple foods in kurdistan mainy consist of rich meat stews with steamed basmati rice, salad, dolma (amazing veg stuffed with rice and meat) kubba (fried rice balls filled with spiced meat), shifta (meat patties)….making muself hungry now! not to mention real kurdish kebab. Hey Joanne – I’m sure I did miss plenty of opportunities…my point in the post was that for a traveler who only has 10 day (due to the visa) and who doesn’t know anyone in Kurdistan, it’s difficult to find places to really sample the local cuisine. There is definitely not an abundance of restaurants out there! Great blog, good info, which is lacking on the net atm! The dorm rooms that you mention, would it be acceptable for a foreign female to stay in these rooms, or are they only provided for men? Did you meet many women travelling on their own while in Iraq? Hey Terri – I’m not too sure about the dorm rooms but I would imagine that they would be men-only. And I didn’t meet any woman traveling on their own in Iraq but at the same time, I didn’t meet anybody traveling there at all 🙂 I didn’t run into any other foreign travelers but I do know that several solo females who read this site have gone to Iraqi Kurdistan since my trip, and they all had a wonderful time based on our communication. I saw that you replied to Terri, I must say that I was a bit disappointed that you didn’t reply to my message on April 25th, about my time in Erbil. Frankly, I thought that you would be very interested to hear my stories, so it felt strange to me, that you didn’t reply at all. If you should like to contact me, for example to see some pictures I took, then you can mail me, of course I would be delighted to share my stories with you. A very good job.Given information covers almost every need of a new traveler to Kurdistan. I hear there are infra structural developments works going on there. I want to visit the place to find out & negotiate possibilities to supply skilled and semi skilled manpower from Pakistan, any hint ? Don’t be disappointed about food. Kurdish food is amazing,but like everywhere you just need some one to guide you to the kurdish (traditional) resturants not to shawrma and falafel shops only. I have been to Erbil, from 10 to 14 April: it was an amazing experience! Can you give me a mail adress, where I can reach you “in private” and where I could send you some pictures? Erbil is very much worth a visit, I spent a good time there, though I must admit that I had the huge advantage of having two local contacts there. And it really paid off, that I learned some Sorani words and sentences: my opening line was always “Rosh bash, min khalki Holandam” (something like: Good day to you, I am from Holland), and you could tell that the people appreciated my attempts to speak their language! The parks were very lovely: of course “Sami Abdulrahman” is the largest, but the “smaller” parks (like Minaret and Shanidar) are also well worth a visit! Public transport (like buses or so) is virtually non-existent in Erbil, but instead there are taxis all over the place, I used them quite a lot. Usually, when I visit cities (like New York, Paris, London, etcetera), I like to stroll the city for hours, really long distances, but that proved to be impossible in Erbil: the large streets have only very poor sideways (so no fun to walk there, apart from the heavy traffic), but more importantly, there are virtually no safe pedestrian crossings to cross the large streets (and I was not so brave as the local people (children included! ), who didn’t hesitate to just cross the road without sometimes even watching if a car was coming…). One of my local contacts was so kind to treat me to a car trip to the beautiful region of Shaqlawa, including the falls of Bekhal and Gali Ali Bag: a truly amazing landscape! I found the Kurdish people very friendly (especially, as I said, when I tried to speak some of their language), it felt absolutely SAFE to walk the streets, even the crowded alleys near the Citadel. It was a nice experience to be there, Earl: thank you once again for your nice info on this page, and once again, if you could give me a personal mail adress, I could send you some pictures, if you like! I saw on your site that you are now in New York, I was there in April 2009, to celebrate my 40th birthday. It was my first time ever to visit New York, or indeed to visit the USA, it was quite an experience! But now, of course, I tell you about my coming travel experience (“God willing”): next Tuesday I will fly to Arbil! No doubt it will be a very exciting trip: on the internet I have already seen many pictures and YouTube-videos from Erbil and other parts of Kurdistan, the city and the mountains really look amazing. You may remember, Earl, that I told you about a colleague who is from Kurdistan: well, some months ago he and his family have gone back to Erbil (is “re-emigrated” an English word…? ), and naturally he was very pleased to learn about my plans to visit his country, and is quite willing to be “my personal tour guide” next week, which will be most helpful! Hey Michel – I do remember and that’s excellent that you’re heading to Arbil!! It has to be one of the most unique travel experiences on the planet right now and I have no doubt you’ll have a great time. Please do let me know how it goes….I’m always curious to hear about other people’s experiences over there. In the last few months the coming visit to Erbil became more and more reality, in fact I have already booked the flight! You will understand, of course, that I can’t give the exact travel dates on this public website, but I will be flying in April with Austrian Airlines from Amsterdam to Erbil (via Vienna), and my hotel (“ChwarChra”) gets very nice reviews, and is situated just south of the city centre. I will spend three full days in Erbil (not counting the days of arrival and departure), of course it will not be enough time to visit “the whole of Kurdistan”, but I will definetely spend one day going to the Rawanduz region. Naturally, three days are but a glimpse, but I can’t get away longer in April (and the summer is too hot for me in Irak…), and those three days will still give me a lot of impressions of the Kurdish culture, language, landscape et cetera. You may remember, Earl, that I have gotten in contact (via mail) with a Dutch woman who is married to a Kurd and lives in Erbil, she was so kind to send me a lovely and detailed map of Erbil, which will be very helpful indeed to stroll around in the city! Naturally, I offered in return to bring letters from her Dutch family and friends to her, in April: which is more secure and reliable than the Kurdish postal service. Earl, I wish you a Merry Christmas and a Happy New Year 2012, with many more trips! Maybe you will visit the Netherlands again, then (they are already on your “I’ve been there”-list, I read)? Enjoy your holidays as well and safe travels! I come from Arbil in Kurdistan. And what i have read is awesome. I really like the way you tell stuff and they are all thrue. You give the people a good view of Kurdistan. I hope one day people all know what Kurdistan is and how its like there. Also thanks to you. Keep doing the great job ! Hey Karwan – Don’t worry, your English was perfect. I’m happy that you read the article and are happy with how I described Kurdistan. It really is a place that I try to encourage others to visit as my experiences were nothing but positive! What a comprehensive overview! great remarks! I understand that in Ainkawa, Alcohol is quite common. Do you have any idea what is the price of local Arak or other kinds of alcoholic beverages? Hey Michael – You’ll actually find alcohol available in many different neighborhoods, not just in Ainkawa. The town of Sulamainiyah also had a lot of shops selling everything from beer to liquor to wine. And the prices are very cheap. While I didn’t see too much local Arak, you can buy very good Turkish Arak at cheaper prices than in Turkey! If I remember correctly, the bottle we bought cost around $3 USD. I hope you are doing quite alright. You may remember that, earlier this year in February, we had mailcontact about Erbil, Kurdistan? I was very interested in your travel stories, as I plan to go to Erbil myself in April 2012 (“Insh’ Allah, God willing, or in Dutch “bij leven en welzijn” [=’should I be alive and well’]”). In the last few months, I have taken some interesting steps in the preparation to my coming visit! First of all, I have come in contact (by mail) with a Dutch woman who lives in Kurdistan, who was quite pleased to give me all kinds of useful travel information. Of course, you will agree with me, Earl, that the best sources of travel information are people who actually live in the region that one likes to visit! Furthermore, I have now started to learn some Kurdish words and phrases (via internet, I for example ‘googled’ for “Sorani phrases”, and I searched YouTube for “Kurdish”). I must admit that I have a huge benefit: one of my colleagues at work is Kurdish, so I can always ask him to help me with the correct pronounciation et cetera. Being able to speak and understand at least some words of Kurdish will indeed be very helpful, my Dutch contact in Erbil underlined that too!. Hey Michel – Of course I remember and I’m glad to hear that you’re making progress with your travel plans. Sounds like you made a great contact in Kurdistan, one that will certainly be quite useful, much more useful than any guidebook. And I think learning some Kurdish words will make a big difference as English is simply not spoken so widely at all. So keep on practicing. Also, please keep me updated as you continue to make your plans. April 2012 is not so far away! Thanks for posting this great information… like Jason, I now have itchy feet and thoughts of visiting this part of the world. Hey Jonathan – Well you should definitely head that way when you can! Ever since I left I’ve been trying to find a time when I can make it back there myself. It’s such a unique opportunity to visit a region that has yet to develop a tourism industry. Hi, thanks for your lengthy post. it’s great but there are some points I need to clarify. * there is no censorship on any website in Iraqi Kurdistan not even anti-Government websites. * Halabja Chemical Attack killed 5000 and injuried 10000 until these days people from Halabja die under the effect of the chemical attack. * there are many foreign-food restaurants you could eat from. in Sulaymaniyah several italian restaurants are available for as low as ~$10. “Roma restaurant” in in Tuy Melik Street offers italian food and it’s a great one. * There ARE ATMs in Iraqi Kurdistan. in Sulaymaniyah there are many of them on the streets & near stores. I myself have a Visa Card to buy thins online. Hey Kaiwan – Thank you so much for the information! I wrote this post based upon my own experiences and I still can’t believe about the ATMs because everyone I talked to in Kurdistan told me there weren’t any ATMs at all! Strange. And I did mention in my post that there is no censorship on any website in Kurdistan, something that was not the case in other parts of the Middle East. Also, I didn’t say that there was a problem with bottled water, only that it was hard to find large bottles of water. Unfortunately, when you have to buy small bottles all of the time, that’s a lot of plastic garbage, which is ofcourse not that great for the environment. You are quite right, it is hard to get information about visiting Kurdistan, so travel-stories like yours are very helpful! I am thinking about visiting Kurdistan as well. I was particulary interested in your information about hotels, when I searched the internet it almost looked like the Erbil International Hotel was the only safe place to stay, but that luxury comes with a “nice” bill, of course (240,000 ID per night for a single room, their website informs me…). Mind you, I would be willing to pay something like that if it would be the only safe and pleasant place to stay in a city (when I visited New York in April 2009, I also payed some 120 USD per night, but I thought it was well worth it, a good and safe night sleep is extremely important to me), but it is good to know (by your reports) that there are more possibilities in Erbil than the high-class luxury hotels, at least to consider. I am curious, though: when landing at Erbil Airport and going through the Kurdistan Customs, isn’t it necessary to have a hotel reservation (to show to the immigrations officer)? When flying to the USA, I had to fill in a form with for example the name and adress of my hotel in New York. Thank you once again, Earl, for your interesting stories about traveling in Kurdistan, and have many more nice trips around the world! As for hotels, staying at the Erbil International Hotel would be a waste to me. There are literally dozens of hotels on the main road just beneath the Citadel, and they are all safe. Kurdistan is one of the safest regions of the world that I’ve ever visited in my 11 years of traveling. 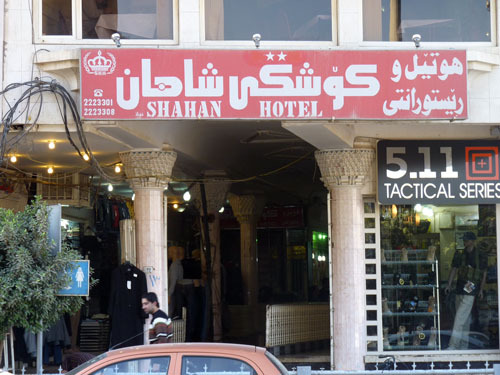 Just take a taxi from the airport to the Shahan Hotel, have a look at the rooms and if you don’t like it, walk out of the hotel, turn right and you’ll run into plenty of more hotels to check out within a five minute walk. There was one, the Samira Miss Hotel, that was a mid-range option and had a very friendly, English speaking owner with good rooms. Across the street was the Shakhan Hotel which had very nice rooms as well. 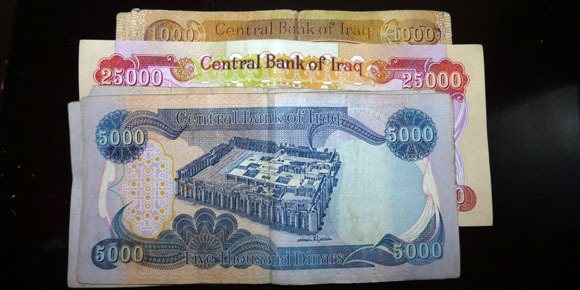 With a nice mid-range option, rooms should be around 50,000 Iraqi Dinars ($40 USD) per night. I hope this information helps you out but as always, let me know if any further questions come to mind! This is a great post for anyone wanting to visit Kurdistan. I’m from Kurdistan and can tell the others commenting that you have got a good grasp of the region. but there are two inaccuracies I should correct for you. Firstly regarding touristic sites. there are actually quite a lot things to see outside the cities. Although they are not developed like other countries with vast experience with tourists, they are not to be missed. Examples are the Gali Ali Bag and Solaf waterfalls which are in Erbil and Duhok provinces. Ask anyone about these and they’ll tell you how to get there. Then there are the many ancient religious sites, such as the Ezidi holy village of Lalish or the mountain Monastery of St Mathew or the volcano top town of Amediye both in Duhok province. Next there is the town of Shaqlawa 40 minutes drive from Erbil in the mountains, which is practically based in a forest and valley. Near Halabja there are the Hawraman mountain villages, although slightly close to the Iranian border you can visit them without trouble and try the local produce and buy local handicrafts, such as Kurdish shoes or Pomegranate condensed sauce. The second inaccuracy is regarding ATMS. Although it’s true they are difficult to find, there are nonetheless quite a few in Duhok, Erbil and Suli. You should ask around if you need to withdraw with MasterCard or VISA. Hey Amanj – Thank you so much for providing all of that information! That is some excellent stuff that I’m sure will benefit anyone who comes across this post. I think the problem is, when it comes to visiting the sites you mention, is that foreign tourists only receive a 10-day tourist visa. During my 10 day stay, I barely had enough time to visit Dohuk, Amadiya, Erbil, Sulamainiyah and Halabja and simply did not have time to visit any other place. I would have loved to explore the regions you described above but when I went to get a visa extension, I was told it was impossible and they rejected my application. So if anyone is somehow able to spend more than 10 days in Kurdistan, then you are right, there are a great deal of sites that one should include on their itinerary! And the ATMs situation is interesting as I did ask plenty of locals about this and every single one claimed that there were no ATMs in Kurdistan. I noticed two banks in Erbil that had ATMs, but they were boarded up with signs saying that they no longer work. Also, in Dohuk, I found one on a random street corner but it didn’t work and looked like it hadn’t been working for quite some time. I’d be curious to know exactly where these ATMs are located if you happen to know. Thanks again for adding your insight to this post! Shukran! I think I had the preconception that it would be expensive to travel there, mostly because of the lack of tourist facilities and infrastructure. But very affordable! Earl, your posts on Iraqi Kurdistan are no good for me. They really get my feet itchy on visiting this region. I love traveling in the Middle East, although it’s been many years since my last visit. With information like what you have provided above (very detailed I must say), you’ve given the traveller everything they need to go an visit this part of the world. Lets hope the region stays stable and the whole sitiuation in the rest of the country gets better as each day passes. Hey Jason – I have a feeling you’d enjoy the adventure associated with traveling in this region as it’s really one of those few places left that doesn’t have a tourist infrastructure in place. And I too hope the situation continues to improve as it would be terrible to see all of the recent progress lead to nowhere in the end. Perhaps a few more tourists would help keep the region growing as well so maybe you should think of taking a trip there soon! Earl, this is a great resource . . . though both you and Anil are really making me want to visit! I love that you listed out prices for pretty much everything, including suggestions, because I can’t imagine that there are many English language resources for traveling in Iraqi-Kurdistan out there. The food thing surprises me – I wonder if they don’t have many restaurant options because the populace cannot afford to eat out. Or, is it because they haven’t adopted a culture of eating out? Either way, it’s very interesting. Hey Akila – Before I went, I was quite surprised by the lack of resources myself, which is the main reason I tried to take as many notes as possible in the hopes of creating detailed (and hopefully useful) posts. At least this information will get travelers started while providing that basic information that is always good to know before we arrive somewhere new. And with the food, I think that the culture of eating out just hasn’t developed yet. From what I saw, Kurdistan is by no means a poverty-stricken third world country and it seems that overall, the people of Kurdistan are enjoying a decent standard of living. So this does lead me to believe that their meals are more family-oriented events, where everyone gathers at home instead of eating at restaurants. And that is certainly an aspect of their culture that I can’t blame them for and wish we had more of back home in the US! Isn’t it strange how so many people in so many countries around the world seem to eat the same thing day after day after day. I guess that when you grow up with so much variety, it become super apparent when your food choices are widdled down to just a few items. I’m currently traveling for 6 months in the South American country of Peru and it seems that chicken is about all that people eat here. I’m a vegetarian, so that makes things even more difficult. Anyway, when you mentioned the food situation it made me think about just how much I appreciate choices and variety. Hey Darren – It sure does make me realize how much variety we are used to when it comes to food. I keep thinking that the Iraqi cuisine is more diverse when it is cooked at home and perhaps the restaurant culture simply has yet to take off, but there is also that chance that they do eat the same few items day in and day out. And at least, as a vegetarian in Peru, you’ll be used to the challenges if you ever do make it to Kurdistan! Thanks for sharing this, Earl. Really useful to have the information, and thanks also for flagging the dangers of Kirkuk and Mosul. Hey Theodora – Anil and I debated back and forth whether or not to visit Kirkuk as some locals informed us that it would be perfectly safe. In the end we decided not to risk it but we still wonder what the situation really is in that city. Perhaps one day it will be safe enough to visit. Very detailed post! I’m sure this will help those planing to visit here. Good to know about the ATMs!! Hey Christy – I can’t imagine what would happen if a traveler showed up without much cash and with no ATMs in the region. And these days, most travelers wouldn’t even think to check ahead of time if there were ATMs, as we tend to assume they are everywhere! Wow! Boy do you ever have some great detail! Love this type of info! @manonthelam: Glad you enjoyed the post. I really try to gather as much info as possible so that my trip may help others visit these places as well! Thank you Earl for these wonderful tips. This is incredibly detailed. I am deeply impressed by your willingness to travel where so few of us have gone. Your courage is inspirational. I appreciate the comment Darrin. It has always been my desire to visit countries that don’t see as many visitors so that I can see with my own eyes what life is like in those parts of the world. I can’t even explain how strongly I feel about this and I wouldn’t trade this desire for anything. what a great & detailed post Earl – not much out there about this, so bookmarked for later this year, we are thinking of going there. Hey Nathan – That’s excellent that this region is potentially part of your travel plans for this year. I’ll look forward to reading about your adventures if you do go, given the constant change that seems to be taking place in the region. Let me know if/when you make a decision!